From Thanksgiving to New Year’s Eve, the holidays are a great time to celebrate and unwind. Due to the variety of festive gatherings, some people tend to drink more alcohol than usual this time of year. For some, the holidays are stressful and they use alcohol as a way to handle their problems. For others, the holiday season is simply a prime opportunity to indulge in even more drinking and alcohol abuse. 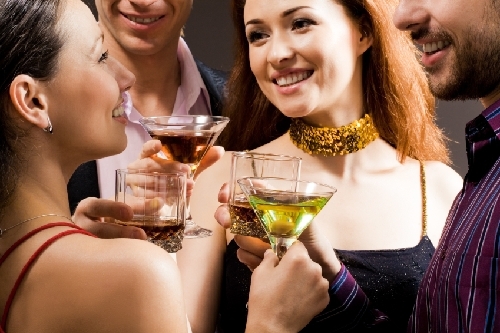 The drinking gap between males and females might not be that far apart this holiday season. According to a new study published in the journal Alcohol, Clinical, and Experimental Research, the alcoholic drinking patterns of women and men are becoming more aligned in the U.S. For the study, researchers from the National Institute on Alcohol Abuse and Alcoholism (NIAAA) examined data from national surveys between 2002 and 2012 that included the number of monthly drinking days, drinking patterns, incidences of drunk driving, and the number of alcohol abusers. The team discovered that monthly drinking had increased in women to 48.3% from 44.9%, but it reduced in men from 57.4% to 56.1%. The number of days that women drank alcohol also increased from 6.8 to 7.3 days. However, men had slightly reduced their drinking days from 9.9 to 9.5. Overall, men are thought to consume 18 liters of alcohol every year and women drink 7.8 liters. Whether you are male or female, if you are going to drink, you must do so responsibly. Unfortunately, some people may not understand what that means. One glass of red wine at a holiday party is probably nothing to worry about for most people; however, consuming excessive amounts of alcohol can lead to poor decision-making. According to the National Highway Traffic Safety Administration, approximately 1,000 deaths occurred as a result of drunk driving during the last holiday season. A recent survey also found that 63% of Americans failed to identify the legal drinking limit of 0.08% blood-alcohol content. Myth # 1: It is safe to drink and drive if you are not acting erratically: The fact is that coordination is compromised before the signs are noticed. Also, the sedative effect of alcohol can increase the risk of an individual losing focus or falling asleep while driving a vehicle. Myth #2: Caffeine, food, or a shower will sober you up: Caffeine may help with drowsiness, but it doesn’t lower blood alcohol levels. The body needs time to break down the alcohol before returning to normal. A hot shower, drinking water, or eating food won’t lower blood alcohol levels either. That means time is the only cure for sobering up. Myth #3: Drinking one alcoholic drink every hour will keep you sober enough to operate a vehicle: Some people believe that since the body processes alcohol at about a rate of one drink every hour, they won’t get drunk if they pace themselves. But, for most people, drinking one alcoholic beverage every hour will affect their level of impairment. Since everyone metabolizes alcohol slightly differently, drinking once an hour likely won’t sober them up enough to drive. Myth #4: You can trick a breathalyzer test: If you’re thinking about fooling a breathalyzer test then you are likely in a situation where you shouldn’t be driving. Breathalyzer “fooling” techniques, like eating a breath mint, simply don’t work. 1. Resist the pressure to drink: Just because alcohol is available, it doesn’t mean you have to drink it. If alcohol is offered and you want to control your intake, or if you are driving, politely decline the host’s offer and continue to socialize. As an alternative, you can choose to drink a non-alcoholic beverage like water. 2. When you stop drinking, alcohol’s effects continue: Alcohol affects the body and brain long after your last sip. The alcohol in the intestine and stomach will continue to enter your bloodstream and impair your judgment and coordination for hours. 3. If you drink, plan ahead: If you are drinking alcohol, always designate a driver. This is someone who hasn’t drunk any alcohol; it is not the person who has drunk the least. 4. Remember that alcohol should complement the holidays: Sometimes it is easy to lose sight of a holiday celebration. It is an opportunity to socialize and have fun with the people in your life. Understand that drinking is an option as much as it is a choice. Try to stop yourself before you go overboard. If you do have too many drinks, find your designated driver and explain that is time to go home. In this case you will avoid any regrettable behavior. 5. Decide what your limit is beforehand: It is a good idea to decide how many drinks you will drink and stick to that number. A blood alcohol chart will help you understand the association between blood alcohol content, level of impairment, and the amount of drinks being consumed. Alcoholism or excessive drinking is a problem all year long, not just during the holidays. Over 100,000 deaths every year are linked to the misuse of alcohol. Negative health effects related to alcoholism include metabolic cellular damage, heart disease, cirrhosis of the liver, fatty liver degeneration, nutritional diseases, pancreatitis, brain degeneration, psychiatric disorders, muscle wasting, skin conditions, hypoglycemia, digestive disorders, and an increased risk of pharynx, larynx, esophagus, and mouth cancers. The Substance Abuse and Mental Health Services Administration (SAMHSA) defines heavy drinking as five drinks or more on the same day, for five days or more during the past 30 days. If this sounds like a regular occurrence for you, it is a good time to seek treatment. Is alcoholism or excessive alcohol use an issue? The conventional treatment for alcoholism often includes detoxification, rehabilitation, and maintenance. Attending Alcoholics Anonymous (AA) meetings can be beneficial. Anti-anxiety drugs like benzodiazepines are used for alcohol withdrawal symptoms like poor sleep and anxiety. There are important nutrients that are necessary in the metabolic detoxification of alcohol. Vitamin A and zinc are common nutrient deficiencies in alcoholics, which can lead to alcohol dependence complications. Supplementing with vitamin A and zinc can therefore help correct these deficiencies. Other important supplementation for alcoholics include magnesium, calcium, L-glutamine, chromium, vitamin C, probiotics, and B vitamins, especially vitamin B1. Drinking alcohol can provoke sustained hypoglycemia (low blood sugar) in some people. Hypoglycemia can also aggravate the emotional and mental problems associated with an alcoholic, and can lead to dizziness, visual disturbances, headaches, hunger, tremors, sweating, anxiety, decreased mental acuity, depression, and confusion. A nutrient-dense meal plan with low-glycemic vegetables helps raise blood sugar levels slowly and controls insulin resistance. Low-glycemic index foods will have a glycemic index (GI) of 55 or less. These foods may include cabbage, broccoli, raw carrots, spinach, and celery. There are certain medicinal herbs that help treat the effects of alcohol abuse. Kudzu (Pueraria lobata) is one the oldest plants used in traditional Chinese medicine. It contains certain properties that help prevent alcohol abuse, including the isoflavones daidzein and daidzin. The flavonoid complex of milk thistle (Silybum marianum) is useful for alcoholics, especially when treating cirrhosis of the liver. Reishi mushroom extract can also help improve liver dysfunction related to excessive alcohol consumption. On the other hand, certain herbs will interfere with alcohol, including chamomile, valerian, lavender, kava kava, and St. John’s wort. Depression is common among alcohol abusers. In some cases depression sufferers become alcoholics. As a result, depressive alcoholics tend to have lower levels of the neurotransmitter serotonin and its precursor tryptophan. To help raise serotonin levels in the brain it is beneficial to supplement with 5-hydroxytryptophan (5-HTP). Psychotherapy, counseling, or life coaching can also help address the negative issues that may have led to the depression and alcoholism. Mindfulness meditation and yoga can also help treat depressive alcoholics. Homeopathy is also widely used for alcohol detoxification. Agaricus in particular is an effective remedy for acute alcoholism, alcoholic headaches, trembling, twitching, jerking, unsteady walking, and a sensitive spine. Other homeopathic remedies that treat the effects of alcohol include nux vomica, arsenicum, quercus glandis, and sulphuricum acidum. Certain medications interact with alcohol, including heart medications, non-steroidal anti-inflammatory drugs (NSAIDs), blood thinners, and sedatives. If you are on any medication, consult with your doctor before alcohol consumption. Some medical conditions can be aggravated by alcohol consumption, such as gout, sleep problems and gallstones. If you are pregnant or planning to become pregnant, you should also avoid alcohol consumption. Edwards, D.W., “Holiday Drinking: Keep It Safe,” PsychCentral web site; http://psychcentral.com/lib/holiday-drinking-keep-it-safe/, last accessed November 26, 2015. “The Truth About Holiday Spirits,” National Institute on Alcohol Abuse and Alcoholism web site; http://pubs.niaaa.nih.gov/publications/RethinkHoliday/NIAAA_Holiday_Fact_Sheet.pdf, last accessed November 26, 2015. Klosowski, T., “Eight Stubborn Alcohol Myths, Debunked By Science,” Lifehacker Australia web site, June 13, 2014; http://www.lifehacker.com.au/2014/06/eight-stubborn-alcohol-myths-debunked-by-science/. Jansen, B., “AAA: Nearly 47M Americans will travel for Thanksgiving,” USA Today web site, November 17, 2015; http://www.usatoday.com/story/news/2015/11/17/aaa-thanksgiving-travel/75921872/. “Understanding Alcohol Abuse—Treatment,” WebMD web site, http://www.webmd.com/mental-health/addiction/understanding-alcohol-abuse-treatment, last accessed November 26, 2015. “Drinking Levels Defined,” National Institute on Alcohol Abuse and Alcoholism web site, http://www.niaaa.nih.gov/alcohol-health/overview-alcohol-consumption/moderate-binge-drinking, last accessed November 26, 2015. “Alcohol and Medication Interactions,” WebMD web site, last updated September 21, 2015; http://www.webmd.com/a-to-z-guides/alcohol-interactions-with-medications?page=2, last accessed November 26, 2015. Gajanan, M., “Gender gap in alcohol consumption closes as women drink more – study,” the Guardian web site, November 24, 2015; http://www.theguardian.com/us-news/2015/nov/24/gender-women-drinking-more-alcohol-men-study. White, A., et al., “Converging Patterns of Alcohol Use and Related Outcomes Among Females and Males in the United States, 2002 to 2012,” Alcohol, Clinical, and Experimental Research, 2015; 39(9):1712-26, doi: 10.1111/acer.12815. Locke, A., Encyclopedia of Homeopathy: The Definitive Home Reference Guide to Homeopathic Remedies and Treatments for Common Ailments (New York: DK Publishing, Inc., 2000), 33. Murray, M., M.D., et al, The Encyclopedia of Natural Medicine (New York: Atria Paperback, 2012), 265-273. Balch, J., et al., Prescription for Natural Cures: A Self-Care Guide for Treating Health Problems with Natural Remedies Including Diet, Nutrition, Supplements, and Other Holistic Methods (Hoboken: John Wiley & Sons, Inc., 2004), 512-517.